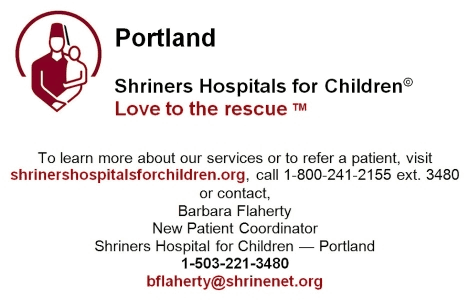 This is the philosophy of Shriners Hospitals for Children, a 22-hospital pediatric health care system which provides excellent, no-cost medical care to children with orthopaedic problems or burn injuries. The orthopaedic Shriners Hospitals for Children help children with problems of the bones, joints or muscles. Three of the orthopaedic hospitals also provide rehabilitative care for children with spinal cord injuries. Four Shriners Hospitals help children who have been seriously burned, or children needing reconstructive surgery and rehabilitation as a result of burn injuries. Since 1922, Shriners Hospitals have been helping children, regardless of the patients' ability to pay. Shriners Hospitals are substantially funded through the Shriners Hospitals for Children endowment fund, which is maintained through gifts, bequests and contributions. Additional income for Shriners Hospitals is provided by an annual hospital assessment paid by every Shriner, as well as designated charitable fund-raising events administered by Shriners. In addition to patient care, Shriners Hospitals are actively engaged in research, searching for the cures and improved treatments of crippling childhood diseases and improved treatments for burn injuries. Shriners Hospitals for Children are also major teaching. centers, affiliated with some of the top medical colleges and universities in the country. Application forms for admission to Shriners Hospitals are available from Shriners, Shrine Temple offices, Shrine Clubs, or by calling toll-free 1-800-237-5055 in the U.S., or in Canada call 1800-361-7256. Applications can also be arranged directly with the hospital via telephone at www.shrinershospitalsforchildren.org. The heart and soul of the Shrine are Shriners Hospitals for Children. These 22 pediatric specialty hospitals help thousands of children each year. The hospitals help children who have problems of the bones, joints or muscles, and children who have been severely burned. The two closest hospitals are in Portland and Spokane. Our Nile Shrine Center provides travel support to these hospitals. Many Shriners take an active part in helping children by sponsoring them for treatment, volunteering in the hospitals, or fund raising. Nile Shrine Temple sponsors Shrine Clubs and special Units, such as the Motor Corps, Band or Clown Units - all of which invite your participation - can help you find a hospital. Just ask a Shriner. More info is available on the HOSPITALS menu above. 800-432-8200 (Washington State only), 425-640-2505 (local), Hours: 10 AM to 1 PM, Monday through Friday.